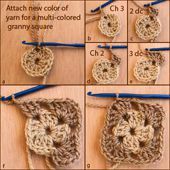 Find free crochet instructions for beginners; learn how to crochet a wide variety of different crochet stitches and projects using our free crochet instructions. If you've never crocheted before and you're a total beginner, our guide to beginner crochet is the best place to start. That page is also a great starting point if you learned how to crochet years ago, but you're feeling rusty and need a refresher. You'll find instructions for everything a beginner would need to know, starting with the ​basic stitches. Pictured here: instructions for how to crochet a granny square. The granny square is an ideal project for beginners to start out with. If you'd like to learn how to crochet with your left hand, see our crochet instructions for left-handers. Crocheting Dishcloths and Washcloths -- Dishcloths and washcloths might not seem too exciting, but they are some of the easiest crochet projects to start out with. This page features general instructions for crocheting dishcloths and washcloths, plus links to free crochet patterns for these types of projects. Crochet Hat Instructions -- This link takes you to our page of free hat patterns. The page includes photos of each hat design, so you can easily browse through your choices and pick one you like. Then all you have to do is click through to get the free pattern and instructions. Crochet Scarf Instructions -- We've posted several pages of free scarf patterns. You'll see a picture of each scarf, along with a brief description; when you've found one you want to make, just click through to get the free scarf patterns and instructions linked. Want instructions for how to crochet a blanket or afghan? You'll find plenty of possibilities here on our website. Pictured here: A custom crochet afghan you can make using our free patterns and instructions. You may also want to check out our main directory of free crochet afghan patterns. Pictured here is a lacy baby blanket border. You can crochet this design or learn how to crochet many others with our free instructions for borders and edgings. Filet Crochet Heart Trim. Filet Crochet Heart Trim -- Photo and Chart © Amy Solovay, Licensed to About.com, Inc.
Pictured here: filet crochet heart trim. with free chart. This design is by Amy Solovay. Beads and crochet are an amazing combination; beads add a whole new layer of texture, dimension and visual interest to a crochet project. Cro-tatting is an interesting technique; the finished projects you make using this technique look like tatting, but they're crocheted.